Q. On Sunday, March 10, we change from Standard Time to Daylight Saving Time. Do I need to change the time on my TimePilot clock? A. The answer depends on which clock you have and how you use it. We addressed this question in our October 2012 newsletter. Here’s a link to that newsletter that gives a complete answer. A. First, a little background: You can collect your clock-ins and clock-outs from the clock with the USB drive at any time during the pay period. When they are transferred into the TimePilot software, the transactions are kept in “Current Transactions.” Think of Current Transactions as a pot where all transactions are held until needed. At the end of the pay period, you “extract” the just the clock-ins and clock-outs that occurred during that timeframe and put them in a separate folder. To get a status report on your employees over a period of time that has not yet been extracted, you can run a report. This can give you the information you need without the problems caused by an early extraction. Survey Says! Do Americans enjoy the extra evening sunlight that comes with Daylight Saving Time? National telephone surveys by Rasmussen Reports in spring 2010 and fall 2009 deliver the same result: Forty-seven percent of respondents agreed that they "don't think the time change is worth the hassle"; 40 percent disagreed. TimePilot Q&A: Daylight Saving Time; Reverse Extraction. TimePilot Best Practices: Using TimePilot "Outside the Box." 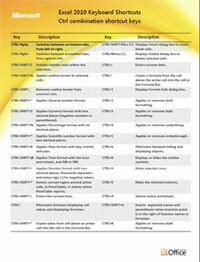 Cool Stuff: Microsoft Excel cheat sheet. The Deal: $30 off TimePilot software upgrade. Phil Gallagher’s eight employees clock in and out daily at a Time Vetro at his workshop. They use five types of portable power tools in his workshop, and each tool is used at a different step in the manufacturing process. When they need to use a power tool, each employee retrieves it from a storage closet in the shop. Phil would like to see how much time each employee takes with each tool. At the end of the week, Phil collects the five clocks and downloads the data they collected. In TimePilot Central, each transaction is tagged with the name of the clock, so he can quickly see when a particular employee “checked out” a tool and when he checked it back in. With all the data now in TimePilot Central, Mary can see exactly how much time each aide is spending at each client and adjust their schedules accordingly. Do you have an innovative way to use TimePilot's products? We'd love to hear about it! E-mail us at Info@TimePilot.com. $30 off an upgrade to the latest version of TimePilot's software, for customers using TimePilot software version 2.92 and earlier. To learn more about the deal and the software, click here, visit www.TimePilot.com/newsletter/newsletter4.htm or call us at 1-630-879-6400.